Clematis viticella 'Etoile Violette' is an old-fashioned French late-summer clematis. It produces lovely large single dark purple flowers with a velvety-textured, deeply veined, and with cream centres. It is a good example of the species Clematis viticella, being easy to grow and with a long flowering period from July to September. Clematis viticella 'Etoile Violette' was raised by Francisque Morel of Lyon, France in the late 19th century. It is sometimes known as 'Violet Star'. 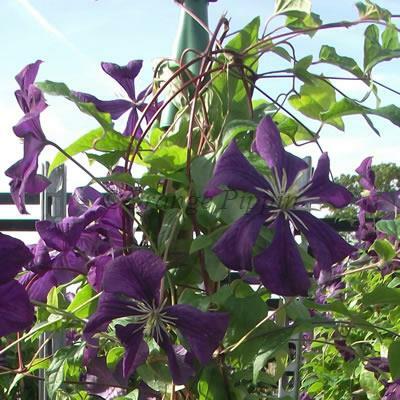 Like most late-summer clematis varieties Clematis viticella 'Etoile Violette' benefits from hard-pruning in January or early February - cut it back to 40cm or so. It will quickly grow back in the spring, readily scrambling up trees to heights of 3m-4m or so. However its growth habit makes it equally suitable for sprawling over a patch of ground.